Settled in Sanur, about 20 minutes drive from Bali’s international airport in Kuta and 10 minutes drive to Bali’s capital Denpasar and easy access to Ubud or to East Bali for sightseeing; one of the oldest tourism developments in Bali early 1970-s which still has its charms of traditional and religion values among people, Bali Emerald Villa is dwelled on the most prestigious resort area in Sanur, where many world celebrities had holidayed here. 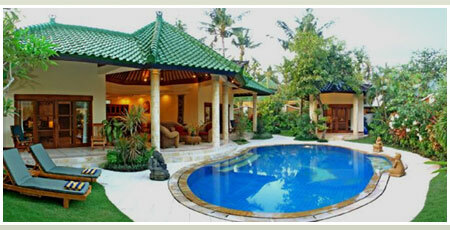 Bali Emerald Villa is situated amid beautiful tropical landscaped garden offers serene and peaceful life, not so far from the beautiful and calmed beach where you can have many exercises to liven up your holiday with snorkeling, swimming, scuba diving, fishing or just jogging through the walks along the beach. Bali Emerald Villa is offering only the superior standard which you can confirm from the moment you enter the establishment, only the best material fusing with construction techniques and Balinese architecture and the best service for your ultimate satisfaction. Bali Emerald Villa is featuring 5 luxury villas and all villas are attributed with queen bed or double bed, daily maid service, large private pool, Air Conditioning, Lanai, ocean view and balcony. Each villa is set with Alarm Clock, Hair Dryer, Stereo, CD Player, Microwave, TV (Cable/Satellite), Ceiling Fan, Refrigerator (Mini), VCR, DVD Player, High Speed Internet access (small extra charge). 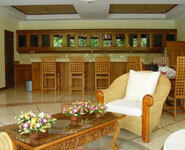 Emerald Bali Villas is featuring 24-hour professional security guards guarantees safety, peace and quiet.